The WaterWorks School Test Kit is a great introduction to water-quality testing. 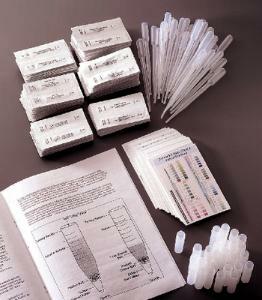 These safe, easy-to-use test strips eliminate the need to mix and dispose of hazardous chemicals and handle glassware. You just dip a test strip in a water sample and then compare it to the included color chart to interpret the results. This kit contains tests for free chlorine, total chlorine, iron, copper, pH, nitrates, nitrites, total alkalinity, and total hardness: nine different tests in all. It comes with enough material to test each factor 60 times, comprising a total of 540 tests to ensure that every student gets hands-on experience. It also includes a manual with background information on water quality and 11 activities on topics such as creating a water cycle, building a well, and testing for acid rain. 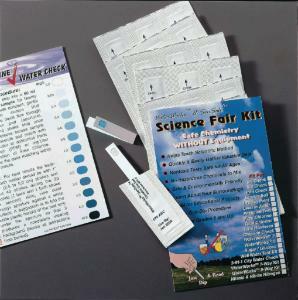 The 9-WAY Test kit tests for the same factors as the School test kit but contains 2 tests for each factor making it ideal for individual projects.